Champion sprinter Lim’s Cruiser has all but secured his ticket for the HK$18.5 million Group 1 Longines Hong Kong Sprint (1200m) after his sensational comeback win at Kranji on Tuesday night. Resuming in the $125,000 Kranji Stakes A race over 1200m since his Lion City Cup back-to-back double in May, the Stephen Gray-trained Casino Prince six-year-old was simply irresistible when he burst through a narrow gap at the 250m to demolish his six rivals with unrivalled ease. 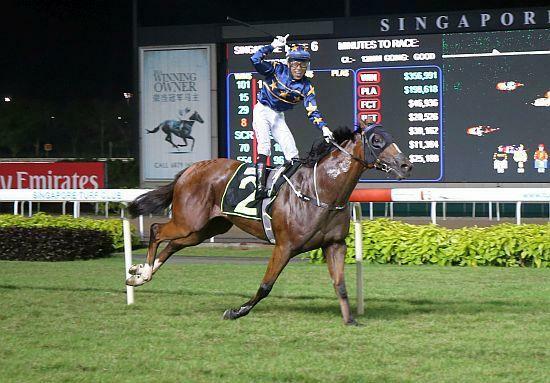 Given a supremely confident ride by Gray’s young apprentice jockey Amirul Ismadi, Lim’s Cruiser, who jumped from the inside alley, was chomping at the bit as he came off his fourth spot in transit to slide up to within a length of Faaltless (Simon Kok Wei Hoong) and Zac Kasa (Michael Rodd). With Zac Kasa keeping him in a tight pocket for a while, Lim’s Cruiser was a little held up for a run, but looking like a short fuse that was ready to explode any second. Riding with a coolness that belied his relative inexperience, Amirul waited just a little longer for the breach to open up a fraction wider before letting rip. The rest was just poetry in motion. Pinning his ears back, the imposing chestnut powered to the line with Amirul just coaxing him along hands and heels. Such was the contempt with which they strolled in that the Ipoh-born jockey could afford to glance over his shoulders twice just to make sure the coast was clear. Easing down before the line, Lim’s Cruiser ($15) romped in by two and a half lengths from Special King (Nooresh Juglall) with Aramco (Zy Nor Azman) third another length away. The winning time was 1min 9.11secs for the 1200m on the Short Course. Zac Kasa, the $8 favourite who was in receipt of five pounds from Lim’s Cruiser (Amirul claimed two) had every conceivable chance, but weakened late to run fourth, beaten by more than five lengths by a winner who might be taking on a whole different kettle of fish next time out. Racing manager Craig Geehman confirmed that the Lim’s Stable-owned star and current Singapore champion sprinter had received the call-up from the Hong Kong Jockey Club even before Tuesday’s race. “Regardless how he went tonight, we would have accepted the invitation from the Hong Kong Jockey Club, anyway,” said Geehman deputising for Gray who is in New Zealand buying horses. “There is a lack of opportunities for him at his level here and Hong Kong has been on his agenda this year. We still have to wait for the final field for the Sprint to be finalised. “He bullocked his way through the gap and he showed he was right on track after coming off a long layoff. To be fair, Zac Kasa probably felt the drop from 1400m to 1200m tonight. Whether it’s Sha Tin or Kranji next, one man who knew he had ticked a big box on his wish-list was Amirul. “Like I said before, I’ve been working this horse from Day 1. I’ve been waiting for this opportunity to ride him for a long time and this win tonight is personally very satisfying,” said the son of jockey-turned-trainer Ismadi Ismail. “He bounced off really well at the start and he loved tonight’s going. They went fast in front, but he was not struggling at all behind them. Not so good, however, was the way he stood high in the irons to jubilate way before the line – an indiscretion that soured his note by $500. While Amirul’s exhilaration was understandable given the symbolism of such a win for a young rookie on a public horse like Lim’s Cruiser, such excessive celebratory gestures are simply not condoned under any circumstances, as it can be a safety issue for both the guilty party and his or her fellow riders. Still lightly-raced considering he has had only 18 starts under the belt since his winning debut in an Initiation race in May 2016, Lim’s Cruiser has now won eight races and placed six times for prizemoney not far off the $1.7 million mark for the Lim’s Stable.